Pennsylvania Mulls Whistleblower Award Law… Again. Will Good Government Advocates Prevail This Time? There have been several attempts to pass a Pennsylvania whistleblower law in recent years. Currently legislators in the Keystone state are grappling with a bill to establish a state False Claims Act. If successful, Pennsylvania would join 28 other states and the District of Columbia. Already, Philadelphia and Alleghany County have enacted similar whistleblower ordinances. Unfortunately, corporate lobbyists have killed off recent attempts. And they are at it again. What is at the heart of the controversy? Fraud. Simply put, the government does not have enough resources to fight fraud. It is rampant in our society and it hits us where it counts… our wallets. Some types of Medicaid fraud actually endanger human life. We have seen doctors performing needless surgeries simply to collect the insurance money. Abraham Lincoln recognized government’s shortcomings in 1863. He persuaded Congress to pass the federal False Claims Act. That law permits ordinary people to become private attorneys general. It authorized people to file lawsuits in the name of the United States and earn a handsome award for doing so. Typically whistleblowers – called “relators” – keep 15% to 30% of whatever the government gets from the fraudster. Because the law provides for large civil penalties and triple damages, the awards can quickly add up. In 2014, the U.S. Department of Justice handed out $435 million in award monies. By incentivizing the people to find and report fraud, the law has saved taxpayers billions of dollars each year. A majority of states have jumped on the bandwagon and passed similar False Claims Act designed to recoup money from wrongdoers who cheat state agencies, schools and state funded Medicaid programs. So why doesn’t Pennsylvania enact its own law? The U.S. Chamber and high powered corporate lobbyists. Some of the very companies that have been caught with their hand in the till are the ones financing the battle to keep Pennsylvania from enacting its own whistleblower award law. Why would the Pennsylvania record write such a biased story? Good question. Because it is a front for the U.S. Chamber’s lobbying arm, the Institute for Legal Reform. The Chamber controls several media sources including the Madison Record, Legal News Line, Louisiana Record, West Virginia Record, SE Texas Record, & Cook County Record. We have no problem with the Chamber expressing its opinion. They shouldn’t attempt to make it appear that it’s opinion is that of a legitimate news source. Just as this blog takes a stand on issues, so can the Chamber. We don’t attempt to disguise who we are, however. Studies throughout the United States have shown that whistleblower award programs save taxpayers millions or billions of dollars annually. Right now, there are few incentives for insiders to come forward in Pennsylvania. It is true that the federal False Claims Act can kick in anywhere in the United States including Pennsylvania but only if federal dollars are implicated. Billions of dollars of fraud occurs at the state level, however. The Pennsylvania Record evidently believes that the “False Claims Act with a qui tam provision creates a perverse incentive for employees to sue their employers, rather than encourage those employees to identify and inform employers of a potential false claim before it is submitted.” Ask any whistleblower who tried to get their company to stop wrongdoing. Most were fired, demoted, ignored or ostracized. What the Chamber doesn’t tell you is that most whistleblowers do report internally first. Only when they are ignored or suffer retaliation do they become a whistleblower and file a False Claims Act lawsuit. Abraham Lincoln realized that rewarding these heroes that step forward is the right thing to do. Let’s hope the corporate lobbyists don’t undo over 150 years of great results. 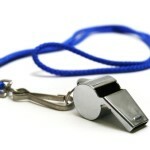 The whistleblower lawyers at Mahany Law have helped their clients collect over $100 million in whistleblower awards. Real money for real heroes. We aren’t afraid to take on the biggest of companies and have the track record to prove it. We are also willing to fight for our clients when retaliation rears it ugly head. Although illegal, whistleblower retaliation is an unfortunate reality, especially for would-be whistleblowers still employed by the wrongdoer. or by telephone at (414) 704-6731. That is my direct dial number. You can also check out our False Claims Act Whistleblower Award page for more information.